Satellite Communication Trainer has been designed to study completely about satellite communication system i.e. how a signal is transmitted and received using satellite standards. The complete unit of Satellite Communication Trainer consists of three sections; Satellite Uplink Transmitter, Satellite Emulator and satellite Receiver. 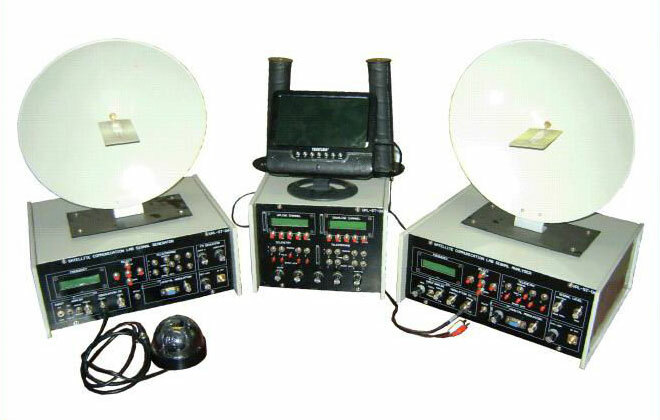 The satellite emulator receives signal from satellite uplink transmitter which can be analyzed and emulated using various satellite instruments like spectrum analyzer. The received signal is then retransmitted to satellite downlink receiver where the signal is retrieved. The signals which are used for transmission are audio, video, and digital data. A provision to connect function generator is also provided. Using the above setup concepts like baseband analog signal parameters, phenomenon of linear polarization C/N ratio, S/N ratio, fading of a received signal, digital baseband signal parameter propagation delays can be studied. Data sent from one computer can be received on another computer using satellite link. Communication of external broad band digital and analog data and base band signals.